Comet 206143A Activator Pucks for 94C Duster, 3/4" Hole, Smooth Cover, 20 Grams. Sold as a Package of 3 pucks. 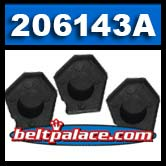 206143A Puck set for Honda Odyssey 209234A Clutch. OEM Comet 206143-A Activator Pucks.